There is nothing more pleasing than a product (or an individual for that matter) that is completely self-aware. It just makes everything less awkward when the fated time comes where one must be honest and up front about things. This is what makes both London Has Fallen and its predecessor, Olympus Has Fallen, so easy to like and enjoy. Both films know exactly what they are and strive to be nothing more (or so I thought given the idea of a sequel to such a film would presumably follow the same pattern). As a blatant Die Hard rip-off that means to entertain a certain type of audience primed for a certain type of entertainment London Has Fallen mostly fulfills that quota. Are either of these films necessarily good? No, not really. The dialogue is cheesy, the CGI is cheap, and the plot is almost completely nonsensical, but to say they're not at least a good bit of fun would be a lie. Gerard Butler (bouncing back somewhat from last week's truly terrible Gods of Egypt) is charismatic enough to lead the charge in this kind of film while the four-man screenwriting team has upped Aaron Eckhart's presidential role considerably so that there is something of a buddy cop dynamic to the proceedings. Oddly enough, while Olympus made $161 million worldwide on $70m the budget for this sequel apparently went up by $35m, but looks a fair amount cheaper. Iranian director Babak Najafi takes over for original helmer Antoine Fuqua and despite having more money, but a broader canvas on which to paint this inevitable, but costly sequel ends up feeling like more of a laborious effort than its rather elementary predecessor. 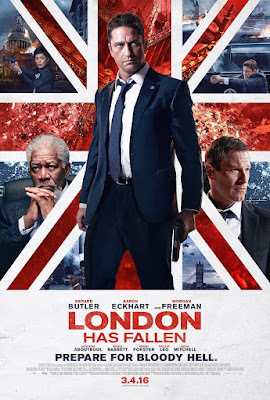 In short, there are times when London Has Fallen does unfortunately forget what it needs to be (a wall to wall actioner) and instead gets too wrapped up in the politics of the plot resulting in a film that's all the more ludicrous while also slowing what should be a breakneck pace. It is when Najafi sticks to what this franchise is known for rather than attempting to broaden its horizons that audiences get what they paid to see. There's a line in the film, some words of wisdom, that go, "never criticize, only encourage," and while this may not apply to film criticism given "critic" is the root word of the job title if I were to have encouraged London Has Fallen to do anything it would have been to stay more true to itself and not try to be more than what it was always destined to be: a painless cash grab. 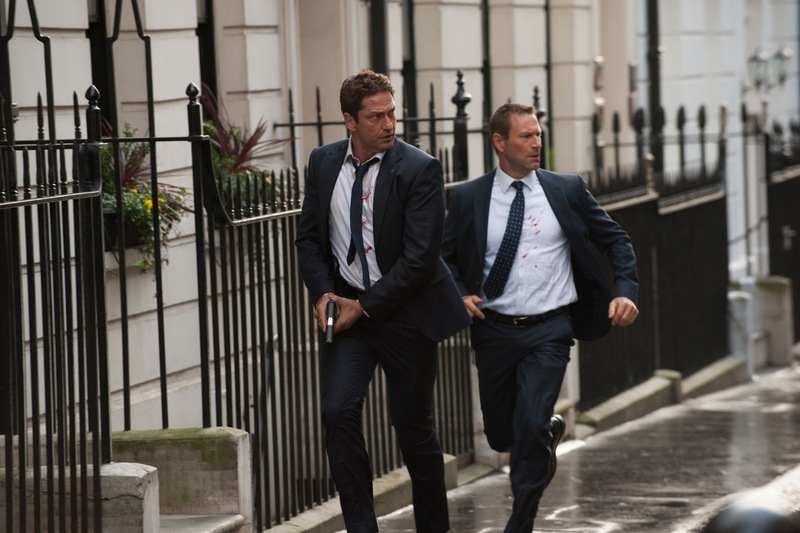 Mike Banning (Gerard Butler) and President Asher (Aaron Eckhart) in London Has Fallen. Beginning with an epilogue of sorts that sets up the reasons why our antagonist (Alon Aboutboul) feels the need to seek revenge we are then quickly delivered back to Washington D.C. where the head of the Secret Service, Mike Banning (Butler), is once again training the President, Benjamin Asher (Eckhart), though this time they are simply taking a jog rather than going toe to toe in the boxing ring. There are quick exchanges of terrible dialogue that have the President asking Banning what he's made of given his apparent peak physical condition while Butler's alpha male responds sarcastically with the line, "bourbon and poor choices." We are then delivered into the Banning household where it is revealed that Mrs. Banning (Radha Mitchell) is expecting and that Mike is considering retiring from the Secret Service so that he might be able to spend more time with his growing family. Of course, this is all exposition so that we might feel an internal conflict of sorts in Banning when the Prime Minister of England suddenly dies and he is summoned to protect the President as they travel to London for the funeral. While this would seem to create a more layered character, with the protagonist having something legitimate on the line and something more to live for, Butler's character essentially forgets all of this the moment shots are fired. Of course, Aboutboul's terrorist, Aamir Barkawi, has somehow crafted a plan so elaborate and so finely tuned that his men have infiltrated numerous British authoritative organizations and are thus able to burn the capital city to the ground from the inside out. As his plan is to kill all of the world's leaders in one foul swoop I'm sure you can guess who gets away and whose job it is to make sure he stays alive while at the same time attempting to find an escape route. All of the old players return as Morgan Freeman's Trumbull has been bumped up to Vice President with Angela Basset, Melissa Leo, Sean O'Bryan, and Robert Forster all returning in their high ranking government roles with Jackie Earle Haley thrown in this time around for good measure. There are a fair amount of theories about where the popular nursery rhyme "London Bridge is Falling Down," came from, but no matter where the song originated the fact of the matter is that London bridges do indeed come crashing down in London Has Fallen and no one takes advantage of such an opportunity. In my mind this is prime real estate for the type of film London Has Fallen should be, but instead the film gets its inspiration for one liners out of situations that have Asher popping out of a closet at the last second to shoot a guy that's about to kill Banning and Banning thanking him with the remark, "I was wondering when you were gonna come out of the closet." It's not that a movie like London Has Fallen needs to be concerned with political correctness or not being offensive because no one should be taking a movie such as this seriously enough to be offended, but one would hope the writers would acknowledge the right cheap shots instead of simply conjuring up the cheapest shots. This is where the film runs into its biggest problem in that it just isn't enough of what it should be. 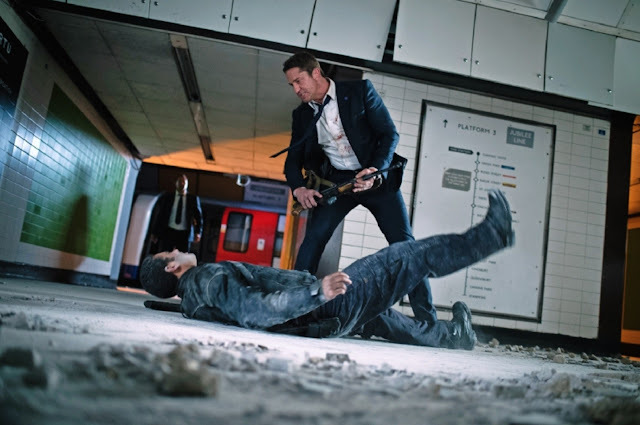 At a brisk hour and forty minutes London Has Fallen should feel as if it hits the necessary beats while shoehorning in a subplot or two all of which are nicely resolved in a single climax with plenty of one liners and ridiculous actions sequences along the way. First of all, there are nowhere near enough one liners as Butler is more about making questionable choices that would definitely come back to bite him later were he not made to be even more of a super hero this time around. As for the action scenes, they become all the more lackadaisical and messy as the film goes on. 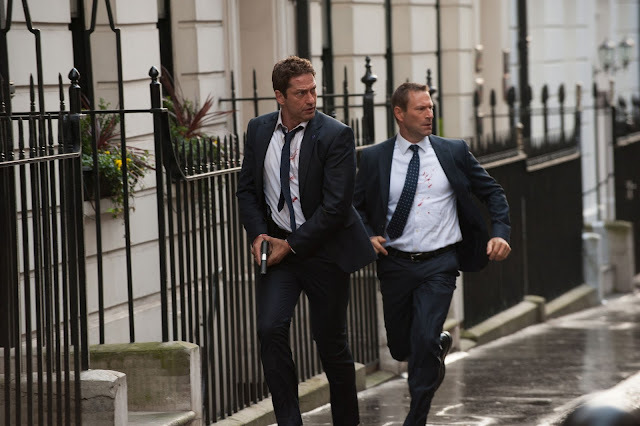 An initial car chase through the streets of London that has Banning swinging out of windows and doors in order to take out his opponents is the films best example of a finely choreographed sequence that stands to hold some tension and emotional resonance, but by the time we reach the point where Banning has to infiltrate an abandoned building that serves as the headquarters for the enemy he is basically just yelling incoherently and firing his gun at random in hopes of hitting anything or anyone. Sure, that may be a bit of a generalization given there is some notable hand to hand combat in that final sequence, but Najafi captures it with such dimly lit and unfocused enthusiasm that it hardly feels worth paying attention to. Banning is once again sticking it to the terrorists, but this time he's doing it across the pond. Furthermore, London Has Fallen makes a point of being both the most American movie one can imagine in the sense Najafi is almost overcompensating to the point he wants to really stick it to Michael Bay while at the same time attempting to do justice to his own nationality by giving the familiar terrorist antagonists a justification for their actions; a perspective that strives to tell audiences they're not so different from you or I, but simply acting in their own defense given their skewed version of us is likely just as skewed as ours is of them. It's an interesting line for the film to walk, but ultimately it doesn't commit deeply enough to any one thought to explore it sufficiently and instead resorts to the expected name calling and short sided reasoning that make us feel better about the violent actions we're taking. This is somewhat reinforced by the way President Asher is constantly questioning Banning's choices throughout despite our knowledge that Banning's stubborn and sometimes sadistic methods will inevitably set both men free without consequences. And so, what else is there to say about a film that knows not to take itself too seriously, but can't help but dip into a deeper conversation every now and then? Not much, because as you're experiencing the film you're hoping it eventually decides what type of movie it wants to be and sticks with it rather than swerving back and forth between tones while trying desperately to strike a balance. London Has Fallen was meant to be little more than a numbingly entertaining action flick that delivered to audiences more of the same and for the most part, it does just that. Neither I nor the movie are completely convinced that's all it wants or should be though. The truth is that there is no need for any lessons or larger ideas because one can only go to a certain depth before everything begins to get questioned and London Has Fallen simply doesn't have enough depth throughout to dip your toes in much less to go fishing for some kind of grand notion. Though London Has Fallen might actually be trying to say something about the eventual and inevitable collapse of all systems including our governments all that comes across on screen is boom and kapow.